The Nestucca Bay National Wildlife Refuge is now open to visitors! The "Cannery Hill" unit is open daily from sunrise to sunset. U.S. Fish and Wildlife have recently created areas to view and admire this beautiful and important area. The official U.S. Fish and Wildlife website says "There are two parking lots on the Cannery Hill Unit, the Pacific View Parking Area has minimal parking so we encourage you to leave your car at the first parking lot and walk the graveled Christensen Road/Trail which is a moderately difficult, 15 minute one way trip that leads you to the Pacific View Trail. Be mindful that you will be sharing the roadway with cars. On the Pacific View Trail you will experience an easy, 10 minute walk on a paved surface with rest benches. The trail ends at an observation deck where you will be treated to a sweeping view of the Pacific Ocean, Haystack Rock, Nestucca Bay, the Coast Range, and the Little Nestucca River". 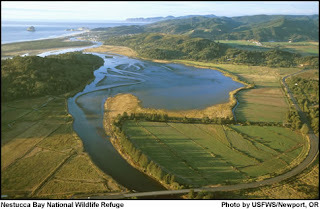 The refuge habitat includes wooded uplands, riparian wetlands, salt marsh, and open meadows. These habitats provide safe haven for waterfowl, shorebirds, raptors, mammals, anadromous fish and amphibians. The Neskowin Marsh unit of this refuge is the southernmost coastal sphagnum bog on the Pacific Coast. It is a rare and outstanding ecosystem with exceptional biological value. In addition to bird and mammal species, the sphagnum bog is home to many unusual and beautiful plant species such as the carnivorous Round-leaved Sundew. The refuge supports 10% of the world population of dusky Canada geese, and the world's small population of Semidi Islands Aleutian Cackling geese, a subspecies of the Aleutian Cackling Goose, and the only coastal wintering population of dusky Canada geese. Directions: The Refuge is located on the west side of Highway 101 approximately six miles south of Pacific City. To visit the refuge turn west off of Highway 101 onto Christensen Road and proceed a half mile to the parking lot. Now that the elections are over, and winter is fast approaching, it's time to start thinking about Thanksgiving and the holidays. For me, this is always a time to look back, be thankful for where we are and to remember that our historic house and B&B has a lot of memories and traditions. The Sandlake Country Inn was originally established in this historic farmhouse by Margo & Chuck Underwood in 1989. Margo was quite a visionary. Yes, the inn has changed a bit over the years and updated, but Margo's original vision is still very evident. One of the reasons we have many, many guests who return over and over the past 19 years, is because Sandlake Country Inn is a place where you can come, relive your memories and be comfortable knowing that even though your life is full of stress and hassles, they all disappear once you've come back. Our style is comfortable luxury, not stuffy. This is a place where you can feel comfortable being yourself and enjoy your surroundings. You know what I mean, haven't you ever been to one of those B&Bs where it's so prissy, you're afraid to touch or sit on anything? No fear of that here. There are a few recipes that have been staples over the years which started with Margo, like our amazing cookies, the baked apple oatmeal and our Hot Apple Cider. I thought I would share one of them with you. 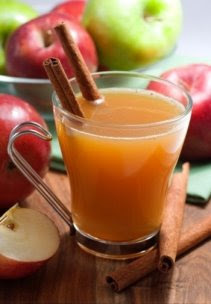 You can make this cider like the recipe says, in a crock pot, but I found that it works just as well in a big pan on the stove if you don't have all day to brew it. Oh, and it makes your whole house smell amazing!! Those people who have stayed with us before at Sandlake Country Inn on the Oregon Coast in Pacific City, know we are serious about our coffee! For the last 2 years Ron has been doing our own home roast with great success. Now for those guests who prefer their coffee strong, we're offering a large Bodum french press pot delivered each morning of your stay! Because the coffee grounds remain in direct contact with the brewing water and the grounds are filtered from the water via a mesh instead of a paper filter, coffee brewed with the French press captures more of the coffee's flavor and essential oils, which would become trapped in a traditional drip machine's paper filters. 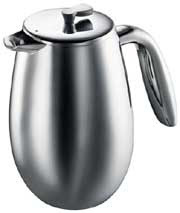 French pressed coffee is usually stronger and thicker and has more sediment than drip-brewed coffee. We specially grind our home roasted beans in a burr mill grinder courser than our drip-brewed coffee. Our new French Press aluminum pots will keep your coffee hot up to an hour, but French Press really should be consumed within 20 minutes after plunging. When you check in to Sandlake Country Inn Bed and Breakfast, we'll ask you if you'd like your breakfast delivered to your door at 9:00 or 9:30 and what beverage you want. Be sure to let us know your preference of our French Press at that time. By the way, our hot beverage service is delivered to your door at least 1 hour before your breakfast time! That way, you can wake up slowly, relax in your robes and slipper socks (we provide them), and outside your door you can collect your hot coffee, tea or chocolate along with juice, cream & sugar, all on a silver tray. If you are an early riser, we have a beverage area available to you 24 hours a day with gourmet coffee, Stash tea, and hot coco. Our famous cookies are also available to you 24 hours a day in our beverage area. It's hard to believe, but it's time to start thinking about the holidays. Do you know someone who needs to unwind, reconnect or just get away from the hustle and bustle of the city? Our Sandlake Country Inn Gift Certificates can be purchased for any dollar amount. 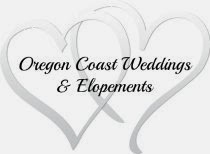 Share with others why the book "Best Places to Kiss in the Northwest" has rated Sandlake Country Inn their highest rating of "Simply Sublime" and why we were voted "Most Romantic Hideaway" in Arrington's Inn Traveler Magazine. When life's stresses are abundant, it's great to know there's a place you can get away to and let someone else worry about the little details. Let us pamper you or your loved ones so your only worry is which bubble bath should you choose? Give the gift of romance and relaxation with our Sandlake Country Inn Gift Certificate.